In my area, we have two bakeries that battle it out for the best burnt almond cake. You either love one, or the other, but it seems that even once you leave the area, you still crave their cake. I love this burnt almond cake, made up (the traditional way) with a white cake, a almond buttercream filling and frosting, and caramelized or toasted almonds pressed into the sides of the cake. It's the cake that, even though I typically bake for any and all occasions, will order when I just need that fix and have the proper excuse. So as I was researching how to make my own, I found many people have the same feeling. And one recipe in particular seemed pretty close to what the two bakeries make. Now, personally, I don't feel that the cakes came out exactly the same, but it was close. I brought the cupcakes into work and everyone was raving about them. So, I'll definitely make them again. I might try Girl Gone Grits' frosting recipe next time, but I didn't have the creamer on hand and didn't want to run out to get some. 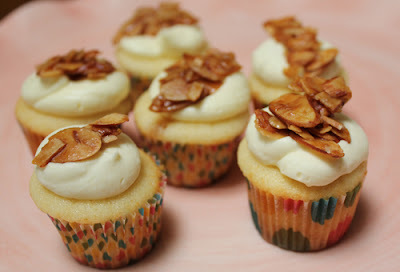 One thing I did add was the caramelized almonds. I took the recipe from the almond brittle ice cream and made a small batch. While this recipe may look like it has a lot of components, it actually is pretty fast to put together. 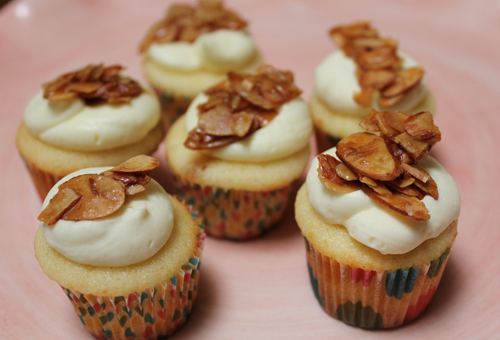 The brittle only takes a few minutes and both the cupcakes and frosting are standard. If you like almonds, even a little, you should make this cake. Oh, and I made mini's. Because I was bringing them to a work event, I didn't think a dozen would be enough. And this way people wouldn't have to commit to a full cupcake. I find that at most potlucks, by the time you get to dessert, you just want a little of everything. 1. Preheat oven to 350 degrees F. Grease and flour a 9x9 cake pan or line a muffin pan with a dozen liners. 2. In a medium bowl, cream together the butter and sugar. Beat in the eggs, one at a time, then stir in the vanilla. In a separate bowl, combine the flour and baking powder. Alternate adding the flour mixture with the milk until all ingredients are incorporated and the batter is smooth. Put batter into the prepared pan. 3. 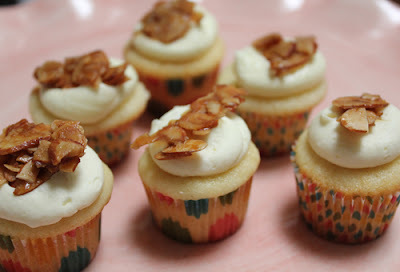 For a cake, bake 30-40 minutes, cupcakes for 20-25 minutes in the preheated oven. The cake is done when it springs back to the touch or a toothpick inserted in the center comes out clean. Remove from the oven and let cool completely. 1. In a medium bowl, blend the butter until creamy. Slowly add the confectioner's sugar (don't add this too fast as it will fly everywhere. Then add the almond extract. Mix, adding the whipping cream until your preferred consistency is achieved. 2. Combine ingredients in a bowl and toss to coat nuts. 3. Spread out on baking sheet lined with baking paper, and bake for 8 mins. Stir, and bake for another 5 mins, stirring a couple of times. Remove from the oven and let cool completely. I'm drooling right now. Also, I'm reminiscing about my wonderful baby shower and that fabulous cake! Mmmmmmmmmmmm!